About 7000 years ago, a pioneering tribe of hunter-gatherers wandered up the coast and rounding Scurdie Ness, they first saw a wide estuary we now call Montrose Basin. These immigrants were the first of many, each group bringing with them their own language. These men and women would have needed to describe their surroundings, and to name them. Rivers have from the earliest times played an important part in human affairs, as sources of drinking water, as means of travel, as obstacles to travel, and even as deities. It is perhaps not surprising, therefore, that the names of rivers have shown remarkable staying power, but cannot be shown to belong to any language. In many cases, their names mean simply 'water'such as Tay or Esk. The language of these earliest arrivals can never be known. Apart from a few Bronze Age and Iron Age remains, the only traces of them may be the river names. Even the Romans, despite being the first literate incomers, left no impact on the place names, either here or anywhere else in Scotland. The Pictish language was a branch of a Celtic group from which modern Welsh, Cornish and Breton also sprang. It was related to, but distinct from, the branch which has given us Scottish and Irish Gaelic. Angus was one of the main provinces of the Picts, and they did bequeath us some place names to mark their sway. 'Angus' itself, from 'Oengus' or 'Unguist' meaning 'unique choice', was originally a personal name but then applied to the area governed by a Mormaer, then to the Earldom, and finally to the County. 'Pert', as in Logie Pert, meaning a wood or copse is another vestige of their language, as is 'aber' (mouth or confluence of a river) which we find in Kinnaber (headland at the mouth of the river). The coining of Pictish names began to fade with the coming of the MacAlpin dynasty in the late 9th century, and the Pictish language was gradually superseded by Gaelic. The Norsemen came frequently enough to give some places in the locality a name, such as Stromnay and possibly Hedderwick. They may have settled and 'intermarried' with the local inhabitants, who at that time were probably Pictish speaking. There are a few other Norse place names in Angus, such as Grimsby in Arbroath and Ravensby near Carnoustie, although more might have been expected considering their prevalence to the north and south. However, some of those apparently Norse names such as -ness and -haven were borrowed earlier into Northern English and came into eastern Scotland from the south rather than the east. A glance at the latest Ordnance Survey Map will show a large proportion of the names in the vicinity of Montrose Basin to be Gaelic or Scots in origin. Those with a Gaelic provenance range from Montrose itself and the Annat Bank in the East, to Balwyllo and Balnillo in the West. The fact that Gaelic and Scots names are so frequent in the area, and Pictish names less so, indicates that the take-over from Pictish-speaking peoples must have been fairly complete, and that many of the settlements must have been named, or renamed, in or after the 9th century. The Gaelic language was gradually retreating behind the Highland Line and giving way to Scots in this area by the 14th or 15th century, initially in the burghs, like Montrose, which were colonised by Scots and Flemish speakers. With the Union of the Parliaments in 1707, it became necessary for the gentry and the aristocracy to make themselves understood in London. From about the middle of the 18th century, this process of standardisation of speech spread through Scots society. The Scots language has given us many of our local names, such as those ending in '-ton', meaning farm. As a representative sample we have Charleton (farm of the carl, or churl, a serf), Kirkton (farm at the church), Maryton (farm at St Mary's Well), Bonnyton (Bondman's farm), and Fullerton (Fowler's farm). Scots speakers must also have named Borrowfield (field or open land belonging to the Burgh), Newbigging (new building), and Broomley (grass park with broom). Although the Pictish names were, to a large extent, superseded by Gaelic ones around the 9th century, a bilingual period of transition resulted in some hybrid names. 'Esk' itself is a river name whose provenance is one of the oldest in the area, being one of the fairly large family of Esk, Usk, Exe, and Axe, no less than eleven of which in Britain were mentioned by the Romans. Five of these take the form 'Esk', and are all found north of Yorkshire. The word derives from a Continental Celtic word 'isca' meaning 'water', or 'boggy place', which would fit well with the lower course and Basin of the South Esk. The Gaelic 'uisge', which of course gives us the water of life -- whisky, comes from the same source. The farm of Drum of Dun farm stands midway between Dun and Old Montrose. It was formerly known as Drum of Old Montrose, but due to the South Esk changing its course in the early 19th century, it found itself on the North rather than the South side of the river. In Ainslie's map of 1799 it is called 'Drum of Maryton'. 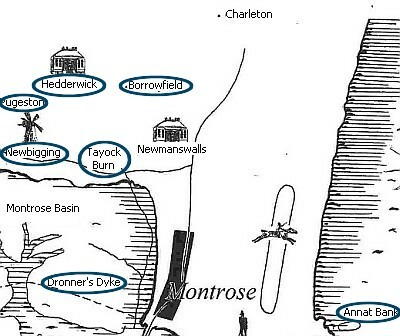 But still as 'Drum of Old Montrose' it is found on Blackadder's plan of 1833 of the Marches between Old Montrose and Dun which was drawn up as evidence in a dispute between the landowners as a result of the river changing course. It still lies within Maryton Parish. 'Drum' comes from the Gaelic 'druim' meaning ridge. As there is no discernible ridge hereabouts, the word may in this case have been used to denote the boundary between the estates of Dun and Old Montrose. The Slunks is a marshy area near the north shore of the South Esk as it enters Montrose Basin. It occupies an area to the east of Drum of Dun farm, which was the former course of the river prior to its change in the 18th century described on maps as 'sea greens'. Slunk is a very evocative Scots word meaning a mire or a quagmire. A salmon pool further up the South Esk is known as 'The Slunk', meaning in this case a ditch. As we enter the South Esk proper, we can look back northward to see the splendid sweep of the north side of the Basin. The Lurgies is a partly swampy area to the west of the river as it enters the Basin. It was reclaimed in the 1820s when Sir James Carnegie of Old Montrose built embankments on the SW side of the S Esk. His efforts were only partially successful as the area was still inundated at Spring Tides and even so, the Harbour Trustees were unhappy about the possible reduction in tidal flow in the harbour. The name may be of Gaelic origin, from 'luirge' meaning a shank-like strip of land, but if so, it must have been named long before any reclamation, as the Gaelic language was no longer then spoken. Perhaps it referred to a feature which was obvious in the original condition of the land. Adam's splendid building can be easily seen from the Basin. It replaces an earlier castle, which stood a little further west and, with its counterpart the Castle of Old Montrose on the south bank of the river, commanded a strategic view of the Basin. The Barony of Dun is one of the oldest and most prestigious in the area, having been given to John de Hastings by King William the Lion in the late 12th century. By far its most famous holders were the Erskine family, which produced a number of figures prominent on the Scottish scene. 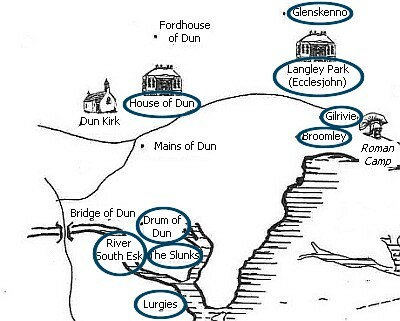 'Dun', meaning fortified hill in Gaelic, is unusual in that it gives us the unadorned form of the name, rather than having the addition of a qualifying element such as in Dunblane or Dunbar. It is found in the estate of Dun and its various dependant farms such as Mains (the demesne or principal farm), Fordhouse (the farm at the ford), Leys (the grass park), and the now lost Crook, of Dun. Broomley, from early times part of the Barony of Dun, was included in the lands given to the See of Brechin by Sir John Erskine in 1409. It was later returned to Dun. The name is almost self-explanatory, from 'broom' with '-ley ', as in Leys of Dun, meaning grassland. The spot was originally called Ecclesjohn, or Egglisjohn, from the Gaelic 'eaglais-' meaning church, and the saint to whom it was dedicated, John. It was a charge attached to Brechin Cathedral and described in the Middle Ages as 'of auld ane chapell erectit for pilgrimage.' The name was changed to Langley Park in 1787 when the estate was bought by George Ogilvy who named it after his estate in the West Indies. Gilrivie Farm lies at the north-western corner of Montrose Basin. Within its boundaries are the remains of a Roman Camp, visible in aerial photographs taken under suitable conditions. The name is of Gaelic origin, but its meaning is obscure. In 1576 this glen was described as Skannack, later as Shanno. The name may come from the Gaelic, 'sgeann-ach' a clean, neat place, or 'sgann-ach' a herding, or drove place. However, in 1656 we find a location named 'Glasker, commonly called Glaskenno, with mill, etc and the Lands of Sands of Northsyde of the water of Southesk…' This might suggest an alternative derivation. This is one of a large number of names ending in -ton, from the Anglo-Saxon, meaning farm, which often have a personal name as the defining element, in this case possibly a gentleman by the name of Poggi or Poca, which is a known Scandinavian personal name. Newbigging Farm, lying about halfway along the north side of the Basin, is marked on Ainslie's map of 1794. It is mentioned in 1637 as being in the possession of Alexander Erskine, having previously belonged to other members of the Erskine family. In the 17th Century it became part of the Hedderwick Estate gifted, on his marriage, to David Scott, one of the six sons of James Scott the Elder, of Logie. In 1819 it was bought by James Cruickshank of Langley Park. The lands of Newbigging included the Mill, which can be seen on Paterson's print of Langley Park. The name is from Scots and simply means 'new building'. It is one of many throughout the country bearing the same name, most of which, curiously enough, are of fairly ancient origin. Hedderwick lies near the head of the Tayock Burn, on the North side of the Basin. It is one of the oldest estates in the area, and may possibly have been granted by King William the Lion to his brother David, Earl of Huntingdon in the 12th Century. The name has changed little in pronunciation over the years, but has produced a plethora of spelling variations, ranging from Haddirvyk in 1340 through Hatyrwic and Hederweik to its present version. The origin of the name has been the subject of some controversy. The 'Hedder-' element, meaning heather is common to many Germanic languages. However '-wick', has alternative meanings. In the south of Scotland and in England its use in place names derives from the Old English word for a homestead or village, as in Hawick, Prestwick, and further south, in Sandwich. To describe a place such as Hedderwick as a homestead would be perfectly acceptable were it not for the fact that no other '-wic' names appear so far north. Perhaps a more likely contender might be the Norse term '-wic', meaning bay or creek, as in Wick itself, Lerwick, and Brodick. The Tayock Burn, although docile and contained now, with the progress of farming practice and the well-attested silting up of the Basin, is no doubt very different from its youthful exuberance at the time of the naming of Hedderwick. The likelihood of a Norse derivation is reinforced by the presence of other Norse place names in the vicinity, such as Stromnay, and Grimsby at Arbroath (found as far back as 1524). Therefore the most likely derivation for Hedderwick may be 'heathery creek', although the possibility that it is an outlying example of an Old English '-wic' name, and hence means 'heather farm' cannot be ignored. At the north east corner of the Basin beside the road to Brechin stood the Cunningar of Tayock, an area of sandy hillocks and whins, still visible in the 1920's. The name comes from 'coninger', a Scots/English word for a rabbit warren. Such warrens were often deliberately established to provide a source of meat. 'Coninger' itself comes from 'coney', the Old English word for rabbit. The suffix '-gar' is from the Norse word 'garth', meaning enclosure (from which we get our word garden), or may be a contraction of 'earth'. It was here in 1542 that George Wishart, the Protestant martyr, turned back and abandoned a proposed journey to Fife, citing the intervention of the Almighty. His companions later discovered an ambush among the sandhills. Still visible at low water running east/west across the Basin are the remains of Dronner's (meaning Drainer's) Dyke. Its construction began in 1678 after the purchase of the 'Lands of Sands' from the Estate of Dun by a consortium led by Robert Raitt of Snadon. Hopes were high, and in the same year Rev Robert Edwards wrote, in 'The Shire of Angus' --- The Citizens of Montrose, by a dike almost two miles in length which they are raising in the bay in the River Southesk, on the west side of the town, will gain, when the noble work is concluded, about a thousand acres of land. And as the sea will forever be shut out, Montrose may boast of lands, of its own acquisition, so fine as to resemble the Elysian Fields. The work was almost completed, but a storm and high tide in the winter of 1679 destroyed it, called up, it was said, by Maggie Cowie, a local witch. The eastern end of the dyke can be seen in Slezer's engraving of Montrose published in 1693. Borrowfield lies on the upper reaches of the Tayock burn. It appears on Edwards' map of 1678 as 'Borrofeild', and on Blackadder's map of 1825 as 'Burrowfield'. The name probably means 'field or farm belonging to the Burgh'. The estate has been in existence since mediaeval times, being mentioned as belonging to the Graham family before 1408 when it was sold to Alexander Gardyne. In 1615 it came into the possession of Hercules Tailzeour, whose family held it until 1806. Depending on the state of the tide, on our starboard side we can now see a portion of the Annat Bank, long a hazard to navigation, particularly in the days of sail. The name 'Annat' goes back a long way, being marked on Adair's map of 1693 and on Captain Greenville Collins' Coastal Pilot's map, also of 1693, as 'Anot'. It comes originally from the Gaelic 'annoit' meaning old or disused church, the church in this case being Inchbraoch, on the south side of Rossie Island. The ruin was used as a forward sighting point for mariners coming up river to the harbour, then known as Stromnay, later Montrose Harbour. The back sighting point was also marked on Captain Collins map as 'Coults', perhaps referring to Fullerton which was purchased by the Coutts family as their country seat in the late 17th century. A little to the west of the site of Rossie Castle, but much nearer the Basin, we now see Baldovie House. Its earliest mention on maps is as Baldive (Edwards 1678), then Balldevie (1693) and Baldovie from 1794. The name probably comes from the Gaelic 'baile domhan' meaning low-lying farm. On 1st August 1545 it was the birthplace of the great Presbyterian reformer, Andrew Melville, who fought against James VI's determination to introduce Bishops to the newly established Church of Scotland. He was prominent at the General Assembly of the Church of Scotland held in Montrose in 1600, when, despite being disbarred from attending by the King, he turned up anyway, and pressed the King again on the subject of Bishops. No doubt he felt that in his home town, he ought to have a right to be heard. Maryton Church is built on a knoll near the foot of Maryton Law and commands a wonderful view of Montrose Basin. The name was originally applied to St Mary's Well which must have been in the vicinity, though no trace of it exists now. However a field on the other side of the Forfar road was called 'Ladywell' on an Estate map of Old Montrose of 1786. The existence of a church here probably predates that in Montrose, and must have been familiar to King William the Lion who frequented the area on hunting trips. It was he who transferred the church from the patronage of the Brechin Diocese to his newly founded Abbey at Arbroath in 1178. 'Inyaney' was the intriguing name of an old estate which 'lay immediately to the West of the Den of Fullerton', according to Rev W R Fraser, author of 'St Mary's of Old Montrose'. The name is derived from the Gaelic words 'eoin' and 'ach', meaning 'place of birds'. It has long fallen into disuse, but it conjures up a picture appropriate to our present day interest in ornithological matters. 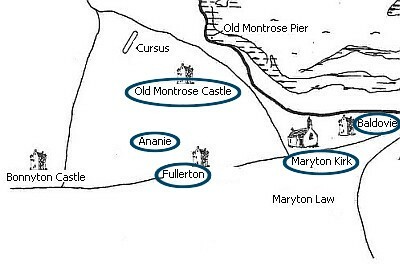 The 'Lands of Inyaney' first appear in the record when King William the Lion, on a visit to Montrose between 1178 and 1197, confirmed a grant to the Gatekeeper (Porter) or Constable of Montrose Castle, a man named Crane, who had a heritable fee of the estate. His son, Swayne and grandson Simon succeeded him. Simon was blessed with five daughters from two wives, but no sons. Daughters, under the laws of the time, did not have an automatic title to the inheritance. Nevertheless, they made a joint claim on the land. A Barons' assize had to be held in 1261 to decide the question, and came down in favour of the five ladies, resoundingly named in the documents as Margareta, Agnes, Swannoch, Christiana, and Mariota. About 60 years later, in 1328, the estate again appears, this time in a Royal charter granted by Robert the Bruce, by then almost at the end of his reign, to Walter Schaklok who, in the same year, sold on one third of his 'Lands of Inieney' to Henry de Rossy, owner of the neighbouring estate. In 1629 the young man later to be Marquis of Montrose was married, at age 17, to Magdalene Carnegie, daughter of the 1st Earl of Southesk. The marriage contract included liferent of one third of the Lands of 'Ananie' as it was then spelled. The Old Manse of Maryton is now called Annfield. Could this be a faint echo of it's past? We can just about see Fullerton Farm from the Basin. The name means Fuller's or Fowler's Farm. It was presumably named when in 1327, Robert I gifted lands in Maryton to Geoffrey, his Chief Falconer for Angus. He took the name Fullerton for his land and for himself. The Fullerton family connection with the estate continued until 1447 when it was sold to the Crawmount family. In 1629 it was included in the marriage contract already referred to between the future Marquis of Montrose and Magdalen Carnegie, daughter of the 1st Earl of Southesk. The name 'Montrose' originated here, and it suits the description of 'moor on a promontory' very well. Remembering that the Basin in earlier times extended farther East (the Lurgies, for instance, being reclaimed only in the 19th century), the Castle of Old Montrose must have stood on a knoll or promontory amid marshy ground in a position which gave clear views of the Basin. Along with Dun, it also guarded the entrance to the South Esk from sea-borne invaders. The first feature sailors coming into the South Esk from the North Sea would see is Scurdie Ness, the name meaning 'rocky point'. 'Scurdie' is a Scots word for rock borrowed from the Gaelic 'sgurr' meaning a peak or cliff. Several 17th and 18th Century coastal charts show an outlying rock marked 'sten' or stone, off Scurdie Ness which lends credence to it being a navigational name. A little south of the Lighthouse can be seen the remains of a quarry. 'Scurdy Rock' quarried there was used for many buildings in Montrose, including much of the town walls, the old steeple and Dronner's Dyke, mentioned below. Interestingly, in addition to referring to rocks in general, 'Scurdie' can mean 'a mooring stone', 'a resting place', either perhaps indicating shipping activity, or 'a favourite seat', a role which it has furnished for generations of Ferrydenners and Montrosians. Right in the shadow of the lighthouse, at the entrance to the river, a tiny creek is marked on old maps as 'Johnny Main's Harbour' or 'Creek of John Mayne'. This is said to have been the landing place of an 18th Century smuggler of that name who lived in a house on the west side of Rossie Island at the Trout Shot. Many tales were told of his exploits in avoiding the 'gaugers', those gentlemen whose job it was to preserve the income of the exciseman, and hence, the Exchequer. The land on the south side of the river from Scurdie Ness almost to Ferryden is shown on old estate maps as belonging to the Usan Estate, owned at least from the 15th Century by the Leighton or Lychton family. The name 'Usan' itself has gone through a tortuous series of changes, the earliest form being Hulysham in 1245. The Old English '-ham', meaning village, is an unlikely derivation for this area so we may have to look elsewhere for a possible definition. 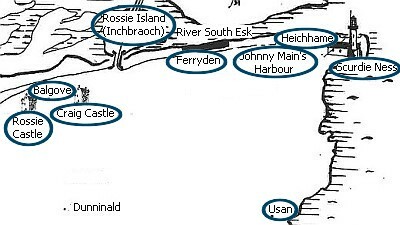 This part of the East Coast of Scotland is scattered with '-haven' names, meaning harbour, such as Johnshaven, Miltonhaven and Stonehaven. So we may have 'Ulli's haven' or Ulli's Harbour after a Norse settler of that name. Another enterprising suggestion is that the name is a part translation of the Gaelic 'port a chaolais' meaning harbour at the kyles or narrows, hence 'kyles-haven', which then became Hulysham. Later forms were Howsane, Willishaven and Ullyshaven. In a Charter of 1704 James Scott is described as being 'of Ulysseshaven', and this lofty tag is repeated in Montrose Burgh Records in 1711 and 1732. The principal memorial at St Mary's Chapel at Mains of Usan is for Patrick Renny 'de Ulysseshaven', who died in 1735. Although the ancient Greek hero was certainly well travelled, no evidence has yet been produced that his Odyssey took in East Angus! The name was later contracted to Usan. Had we been passing this way three or four hundred years ago, and seen the river as shown by Captain John Slezer in his well-known engraving 'A Prospect of the Town of Montrose' published in 1693, we would have noticed a straggle of huts on the crown of the escarpment, known at the time as Heichhame or Highholme. It was a village of fishermen, but unlike their successors at Ferryden, these men fished for salmon in the South Esk, rather than going to sea for white fish. Heichhame must have existed for centuries, but is first documented in the early 17th century when it was part of the Usan estate which was owned by the Lichton or Leighton family from at least 1260. They sold the estate in 1618 to David, Lord Carnegie. In 1632 a contract was concluded between Sir James Carnegie of Craig and Alexander Bell of Claylek, whereby 'the said Sir James lets to the said Alexander, the Lands of Hichome in the Parish of Inshbreak and the Sheriffdom of Forfar, for 40 bolls oatmeal and 20 bolls beir.' It passed through a number of hands, usually accompanied by salmon fishing rights, but dwindled in importance, probably due to being less well-situated for salmon netting than other fishing stations further up river, and to the rising importance of Ferryden. The fishermen of Heichhame finally settled in Montrose in 1776. The 'Lands of Heighome' were said in 1805 to lie 'at the mouth of the river Southesk … where landmarks for shipping are marked on Ainslie's map'. These landmarks are still standing. They now also serve to mark the grave of a vanished village. Ferryden itself is represented in Slezer's engraving by only one building, presumably the ferryman's house. The ferry, however, has been there at least since 1178 when the Founding Charter of Arbroath Abbey included the gift of the 'ferry at Munros'. The ferry and its revenues are part of a number of land charters for the estates of Usan, Craig and Rossie in the 16th to 18th centuries. The village of Ferryden was not founded until the middle of the 18th century, when Hercules Ross of Rossie invited families from the Moray Coast to set up a white fishing enterprise. An English traveller, Thomas Pennant, passed through in 1775, and 'crossed the river Southesk in a very good ferry'. Only 20 years later this 'very good ferry' was to be superseded when the first wooden bridge, known as the 'timmer brig' was opened to traffic. The '-den' part of the name denotes a small wooded valley in Scots and is often used as a descriptive term in Angus and other parts of Lowland Scotland. Beyond the modern railway and road bridges is the Harbour. This area was known to the Vikings, or at least Norse-speaking invaders, as Stromay or Stromnay. The name, from the Old Norse 'strom-a', which means 'tide-race river', is one of few in the area which can be said to have a Scandinavian origin. A name from the same root is Stromness in Orkney. Stromnay, no doubt a huddle of shacks, was perhaps originally no more than what would later be called an 'entrepot' for Scandinavian traders. It is thought to have been situated near the North end of the present bridge, at the point where Seagate meets the shore. The name Stromnay passed out of use in the late 15th century and the area was later called Fishboats. On South side of the river, is the island of Inchbrayock, familiarly known as Rossie Island (no longer an island after 1972). The name Inchbrayock or Inchbraoch is a Gaelic one, meaning the Island of St Brioc or Bhriuc. 'Innis sancta brioc' is mentioned in the mediaeval Registrum of Aberbrothoc. 'Sanct Broc', whose day was May 1st, is one of the earliest saints in the Calendar. She lived in the 5th century and evidently came from a very pious family. She was the aunt of a much better known saint, St Brigit, known as the Celtic Virgin. There is a place in Cornwall called St Breock, and one in Brittany called St Brieuc. A now discredited suggestion, put forward in the 19th century, was that the second element '-braoch' came from the Gaelic 'breac' meaning 'speckled one, trout'. As the river to the west of Rossie Island has long been known as the Trout Shot from the abundance of sea-trout caught there, this looked on the face of it like a plausible alternative. But although there are other well-attested 'breac' names in Scotland, the earlier mentions of dedication to a saint rule this out. Craig House, which now overlooks us from the south, has claims to being the oldest inhabited building in Angus, perhaps even in Scotland. It has watched the parade of history at least since Edward I of England passed by on 7th July 1296 on his way to accept the surrender of the Scottish Crown by John Balliol, thenceforward known as Toom Tabard, the empty coat. It is shown on Adair's map of 1693, apparently with a surrounding park, and as 'Craig House' by Ainslie on his map of 1794. Known at various times as Craig Castle, it was bought in 1505 by Sir Andrew Wood of Largo, Admiral of the Scottish Navy. The name 'Craig', from the Gaelic 'creag' meaning rocky hill, is one of the commonest hill names in Angus. The farmhouse and steading of Balgove overlook Montrose Basin from a point about halfway between their more imposing neighbours Craig House and the now vanished Rossie Castle. The name probably comes from the Gaelic 'baile', a farmtoun, the second element being either 'gobhain' a smith, or 'gobhar' for goat, the whole meaning a smith's steading or a goat farm. There is a tradition that Balgove was the site of a 'withy house' or prison in mediaeval times, but there is no documentary evidence to support it. The place of execution was said to have been at Govanhill, about two miles to the southwest, quite a trudge for the condemned. On the hill to the South of the Basin are the lands of Rossie, a name whose history stretches back at least to 1245 when Thomas de Rossi had a Charter of the Lands of Rossi from Hugo de Malherbe. Walter de Rossy, Burgess of Montrose, rendered homage to Edward I in 1296. In 1578, in a Charter issued at 'Halyrudehous' to James Rossye, son and heir to David Rossye of that ilk, the lands were said to comprise… the Lands of Mylntoun of Rossye with the manor and two corn mills thereof, the Hoill Myln [now Holemill], the Lands of Stanelaw, Montboy and moor thereof, Westerton of Rossye and three-quarters of the Mains of Rossye … The Estate was a large and important one until recently, partly due to its also holding, at various times, the other local estates of Craig and Dunninald. Its eminence also arose from its control of the salmon fishing both on its own frontage on the river, and also on the North side, where the Scott family held a firm grip on the Burgh fishings for many years. The name 'Rossie' comes from the Gaelic 'rosach' meaning 'wooded part or point'. This could fit the topography of the area well enough, although it is possible the original family imported the name from their lands of Rossie, in the Carse of Gowrie. Curiously, a similar transplantation of the name occurred again in much more recent times when Horatio Ross, proprietor of the estate in the 19th Century and at one time MP for Montrose, sold the property in 1853. He was a well-known sportsman and champion shot. Perhaps finding the opportunities for deer stalking limited in Angus, he moved eventually to Inverness-shire where he died in 1886, at his home -- Rossie Lodge!